This model replaced the Beolit De Luxe 611-FMK. Outwardly it was very similar, but can be easily recognised by its restyled tuning dial, round metal (instead of rectangular white plastic) pushbuttons and slightly different control knobs. The new knobs were all the same size (previously the tuning knob had been larger) so in order to make the tuning control easier to recognise at a glance it was given a black centre. Text copyright © Beocentral. Unauthorised reproduction prohibited. Internally the receiver circuit remained largely unaltered but the audio amplifier had been redesigned. The amplifier in the original version used five transistors and although capable of reasonable performance had in truth a little too much gain, leading to excessive background noise and a volume control that could prove difficult to adjust. The new circuit had only four transistors, replacing two PNP germanium types in the preamplifier with a single low noise NPN silicon device. This change brought improved performance at the cost of slightly increased battery consumption. Text copyright © Beocentral. Unauthorised reproduction prohibited. The Beolit 700 was dropped from the range when the Beolit 1000 appeared. 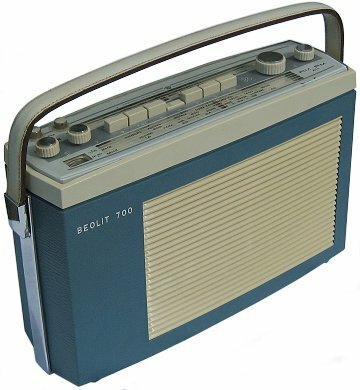 The name would be revived in the early 70s however for the new AM/FM Beolit 700, at the top of the Beolit range of the day. Text copyright © Beocentral. Unauthorised reproduction prohibited.